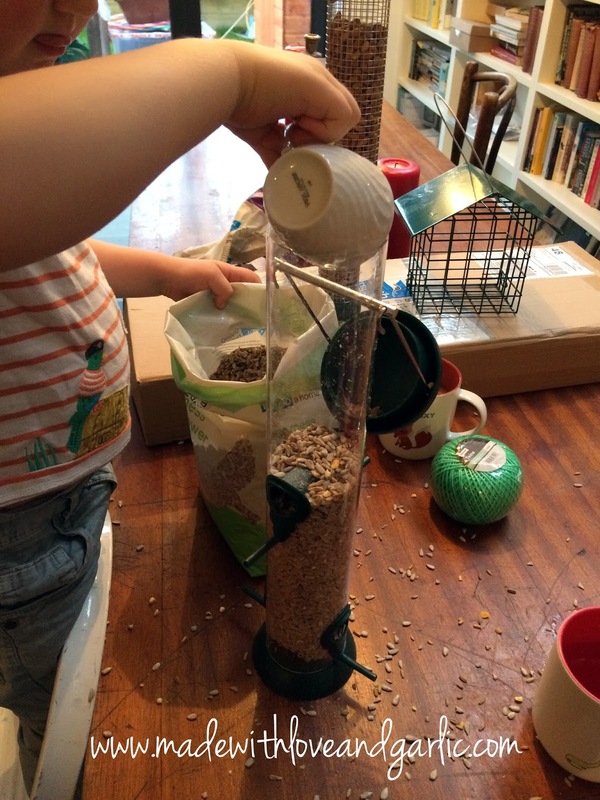 A rainy weekday afternoon and an overexcited toddler with energy to burn combine brilliantly to mean one thing – bird feeders! We had a birdfeeder outside our sitting room window before we embarked on our harebrained scheme to gut and refurbish our entire house last year. For almost the entirety of 2016 it was therefore replaced with a skip, more rubble that I can believe honestly came from this house and a variety of builders pretending they weren’t murdering our garden. However, now that the trauma is over, we are ready to do our bit to help sustain the urban bird population. Usually the closest we come to seeing birdlife in our part of South West London is the carpet of chicken bones spread all over the pavements after the weekend (horrible, like a chicken genocide. Chicken shops that serve drunken patrons have a lot to answer for). Garlicboy got a bird spotting book for his birthday last year and so I was keen to set a feeder up by our window where he could learn to identify the birds that come to visit. So I’ve had our feeder and some nuts and seeds ready and waiting for a rainy day. 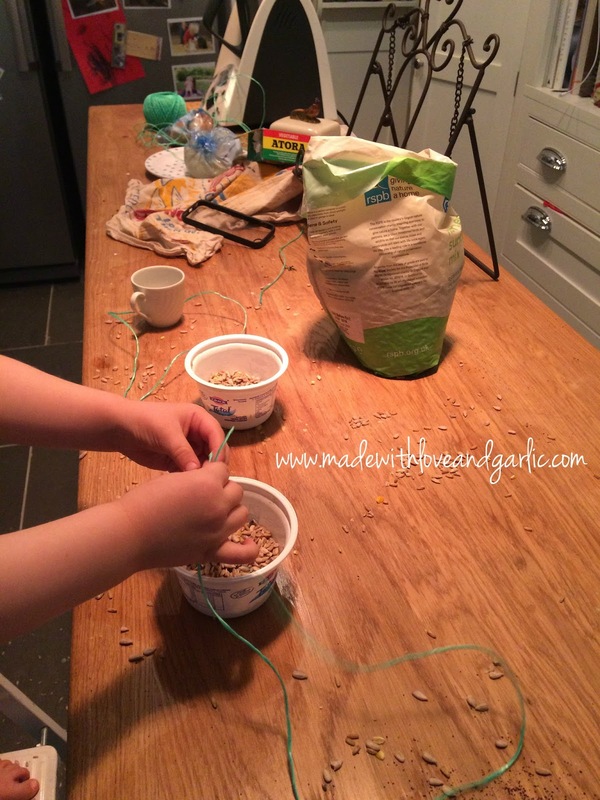 This is such a fantastic activity for a toddler as they can really get involved by filling the feeders and helping to make the suet / fat bird cakes. First we made the suet bird feeders using the RSPB recipe as a guide that we adapted for what we had at home. 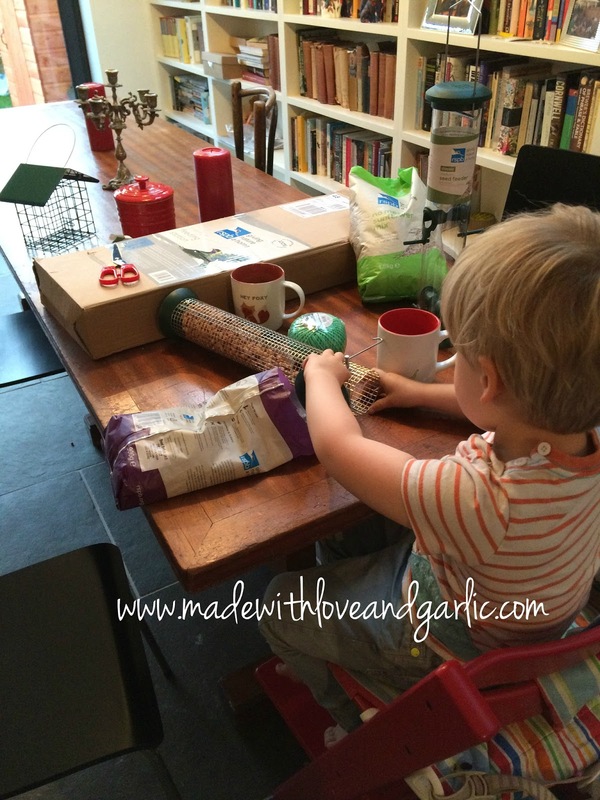 I find the RSPB schools guide a really good source of inspiration when looking for activities to do with GarlicBoy. Whilst the bird cakes were hardening, I got out the bird seed and peanuts and gave them to GarlicBoy with a spoon and a tiny cup so that he could fill our feeders. 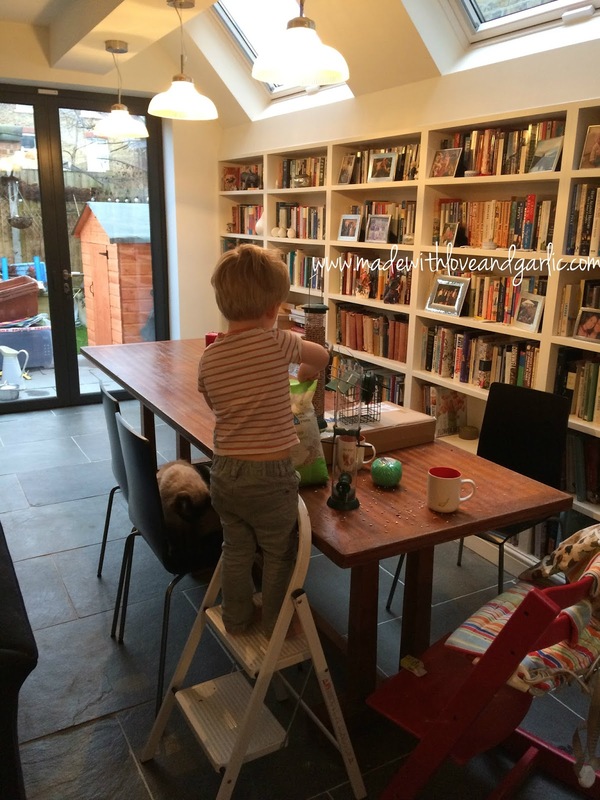 This was a fantastic activity and he really enjoyed filling them using his hands, a spoon and the cup. Again, it was really messy but he had a ball and the seeds etc liberally carpeting the floor were easily hoovered up in a couple of minutes when we were done. 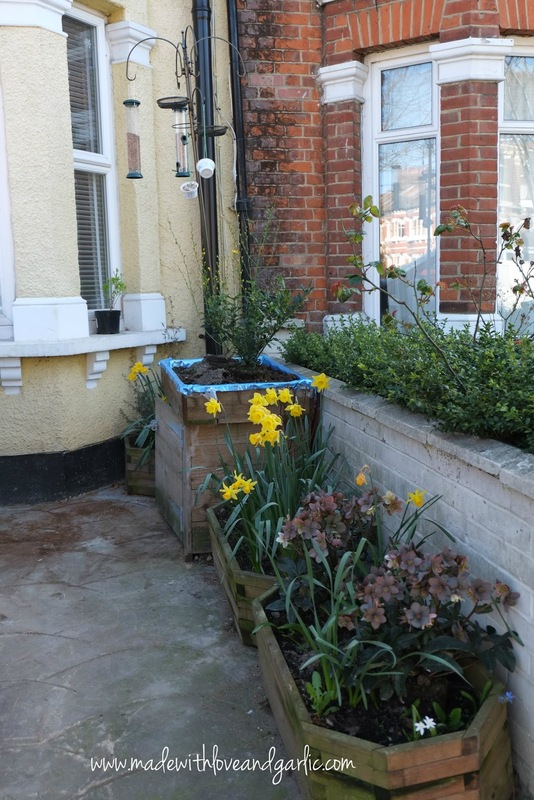 We then did puzzles and played with his trains and did some reading for a couple of hours until the bird feeders were hardened and then just before supper we went out to the front garden and set up our larger bird feeding station (complete with a small dish of water). As of going to press not a single local bird has visited our feeding station (the small, feathery ingrates…) but we remain hopeful and our RSPB bird book for children is stored by the window in readiness so that we can start our ornithological adventures together as soon as the birds decide to play ball. 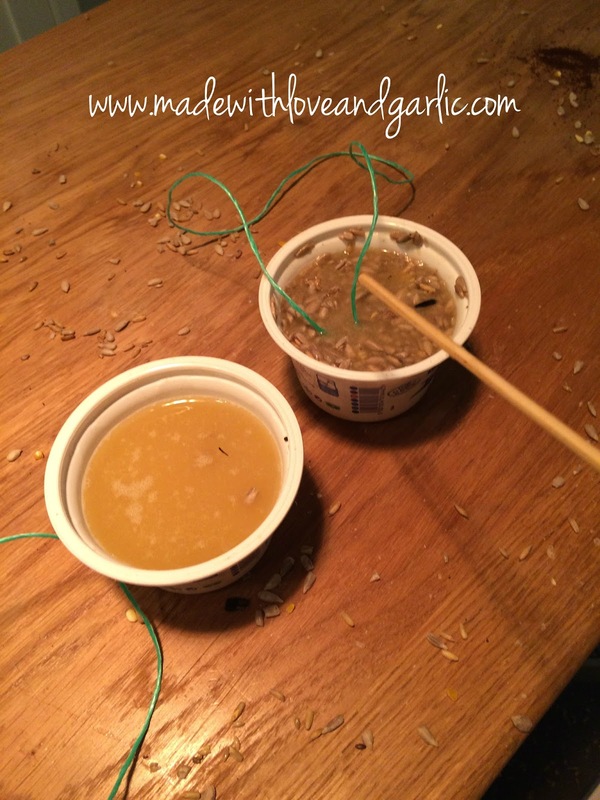 – Playing with and scooping seeds and peanuts into feeders (and seeds into the yoghurt pots for the fat feeders). REMEMBER to supervise your child closely because if they’re anything like mine they’ll try to inhale the nuts which could be a choking hazard. – Stirring the seeds into the liquid suet. Again, the suet will be hot so please keep a close eye on them, don’t let them touch the sides of the pot and keep an eye on their stirring speed so they don’t get splashed. – Identifying any feathery visitors! Disclaimer: The activities suggested on this blog are suggestions only. You know your child and their abilities best and should always supervise any activities closely. Also please note that I am an Amazon affiliate. You can learn more about my affiliate status here.